A superbly entertaining 60-minute show for all ages, "Untapped!" features a hip, all-male cast of five expert tap dancers backed by a three-piece rock band and a beat boxer who also does some standup comedy. Directed by Andrew Fee and presented by his Australian-based troupe, Raw Metal Dance, the show puts forth a fresh style of tap dancing that's strong, contemporary, and highly virtuosic yet propelled by a loose, easy, natural energy. Devoid of the aggressive, heavy, pounding style that has marked much of the cutting-edge tap dancing of recent decades, this company's light approach cajoles the audience with rhythmic playfulness, humor, and challengingly inventive new versions of old steps. One dancer does a series of wings in a toe stand; another does a ballet air tour into a jazz split, à la the Nicholas Brothers. And after wowing us with their difficult moves, a cocky duo underlines how far they are pushing the tap-technique envelope by juxtaposing their advanced steps with tame, old-school flap-ball-change combinations. With its hard-edged rock music, beat boxing, and intimidating metallic set (designed by Fee), the show has a "guy's night out" feel to it. While dance shows at the kid-friendly New Victory Theater typically attract lots of little girls, the performance I attended had many more fathers and sons in the audience than mothers and daughters. But the production's heavy-metal sensibilities should not deter feminine audiences. Many of the tap routines are done a cappella, and the young dancers are all of the tween heartthrob variety—cute, funny, hot, disarming, and quirky. And their appeal is heightened by their Australian accents, heard in an amusing scene in which they comment on individual movements each performer is contributing to the choreography of a group sequence. Choreographed by Fee and the dancing cast—Reece Hopkins, brothers Daniel and Matthew Sintes, and Sam Windsor, in addition to Fee—the show provides a stimulating and educational introduction to tap dance. 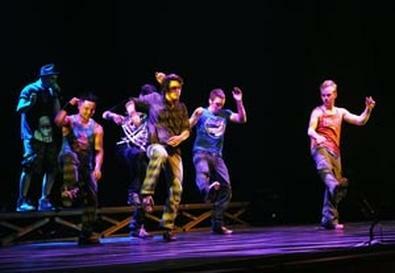 Though in no way pedantic, it illuminates the relationship between tap dance and music by clearly and simply illustrating how dancers hear and respond to what an instrumentalist is doing, how dancers trade rhythms and build on each other's steps, and how improvised solos grow out of, fit into, and serve the larger structure of a choreographed routine. Presented by the New 42nd Street at the New Victory Theater, 209 W. 42nd St., NYC. Nov. 11–27. Fri., 7 p.m.; Sat., 2 and 7 p.m.; Sun., noon and 5 p.m. (Additional performances Wed., Nov. 23, and Fri., Nov. 25, 2 p.m.) (646) 223-3010 or www.newvictory.org.